Browse and vote for suggestions and post your own ideas on our community forum. Stay up to date with new releases and features. Workflows carry out your business rules when a Transaction, Activity or Account changes from one status to another. Use the Workflow Designer to define status transitions and set actions for activities changing back and forth between statuses. Each of the status changes can trigger multiple actions. Workflows provide unlimited flexibility in defining exactly what happens at every point in your business process. How do I know if I'm using the new Workflow designer or still on the old Workflows? To check if you are using the new version of Workflows go to Settings -> Sales Activities -> Transaction Types and edit the Transaction you would like to check. Go to the Workflows tab and check if you have the visual style workflow. If not, then contact us to turn on the new Workflows for you so you may use the new features, and Pepperi Managers App to manage Activities and Transactions. You can now trigger actions such as notification, credit validation, Email, alerts, and more when a new Account (customer) is created by a user on the mobile device. For example, trigger an address verification form to pop up when a user creates a new Account that verifies address fields such as City, State, Street against a predefined list. A detailed lists of the actions available for Accounts is in the table below. The Workflow Designer has an easy-to-follow visual flowchart representation. Workflows are still located in the same place in the Workflows tab of the Transaction, Account or Activity. Each status change defined in the Workflow may have one or more Actions associated with it. To Add a step, click "+Step" and give the Step a name. The step name will be used as the text on the "Submit" or "Done" button on the Transaction, Activity or Account creation form. In the example below the name "Validate order" will appear instead of the text "Submit" on the shopping cart. The actions defined in this step will be executed when the Transaction changes status from In creation to Submitted. 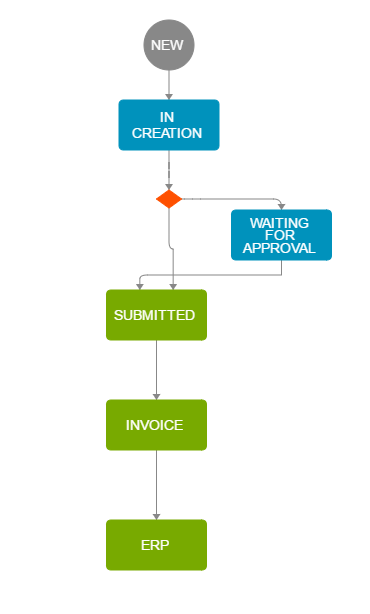 Building a workflow like the one shown in the diagram above requires you to add steps and actions for each of the required status changes, and then the diagram above will be automatically generated. Actions are divided into "Actions and Branches" and "Post Actions" - see table below for details on each action. Actions are triggered by Status changes in the Workflow of the Activity/Transaction/Account. This action displays an alert message in a dialog box with the option to Cancel or Continue. Cancel - dismisses the dialog and returns the user to what she was working on. Continue - continues to the next action or step in the workflow. Message may be formatted using HTML. This action displays an alert message in a dialog box on the condition that the selected rule is evaluated to the indicated value (true/false). Cancel - dismisses the dialog and returns the user to what she was working on. Continue - continues to the next action or step in the workflow. Message may be formatted using HTML. This action displays a notification message in a dialog box. The user clicks OK and the workflow continues to the next action or step. Message may be formatted using HTML. The Workflow will be stopped on the condition that the selected rule is evaluated to the indicated value (true/false). A message will be displayed to the user, allowing them to go back and modify the order/activity accordingly. Message may be formatted using HTML. At the beginning of a Workflow check if there is an open Activity \ Transaction of the same type and for the same Account. If so, either ask the user if they want to continue it, and direct them to the list or force them to be directed to it, in which case it will be opened. This action is available for the New to InCreation status transition only. This action is not available for Account Workflows (Activities and Transactions only). The Workflow will be stopped on the condition that the Webhook (web service) is evaluated to false. A message will be displayed to the user, allowing them to go back and modify the order/activity accordingly. This action executes a Webhook and branches the workflow to another step based on the status selected in case of failure. Custom Form Allow you to run your own code from with in the Pepperi app. Run your own HTML code in the background, or display results to the user. Branch Condition This action evaluates a Boolean rule and branches the workflow to another step based on the status selected in case of failure. Select from a list of Boolean rules created in Custom Fields. Select the status in case the rule fails to evaluate. Open Form This action allows you to select a form that will be opened for the user to fill in. If the form does not contain fields marked as mandatory it will not be opened. Selecting \'Force always open\' will open the form even if does not contain mandatory fields. Force Sync This action forces the mobile app to sync. Use this action if you want the user to sync before beginning an activity to make sure they have the latest updates. For example, to make sure they have the latest item inventory before submitting an order. Split Order This action splits the order among multiple locations (ie chains) and creates a separate Transaction for each location. Select the Transaction Type for the newly created orders. Capture Geolocation Captures the Latitude and Longitude coordinates of the device (to custom fields of type Decimal value). You can capture the location not only upon submission, but during any other status change. An accuracy radius is captured as well (Decimal value). If you want to view Activities on a map view in the Managers App, then you must use this action in the New -> In Creation transition, or in the last transition before submission. Activities can be pinned on a map based on either the Creation geolocation or the Submission geolocation. Capture Date & Time Captures the Date & Time and saves it in a custom field. This is actually a timestamp you can initiate at any point in the Transaction or Activity that allows you to capture when a specific event such as a change in status, payment, sync, or alert occurred. You can then display it on any form or report. Alert the user of events when the app is closed on their device. Send your own customized text in Push notifications, alerting the user at any point in the Order or Activity Workflow - just like any other app that pops up notifications on your phone or tablet, such as WhatsApp or Facebook. Export File to FTP This action will post a file in the format selected with the order/activity data to the Pepperi secure FTP server. This file can then be imported to any ERP/CRM or other system. Distribute Activity (for Activities only not Transactions) This action duplicates the Activity for multiple Accounts. Select the type for the newly created Activities. Navigate to After the Actions in this step are completed, the user will be redirected to the page they were on previously, an Activity List of your choice, or stay on the same page. Select from the options in the menu. The default is one screen back. You can fully configure the layout of the Account Dashboard - including the Menu, Header, Toolbar, Recent Activities, Upper/Lower Dashboard. You can remove some of the components completely by deleting them from the layout. For example, you can delete the "Recent Activities" bar across the top of the Account Dashboard if you want to use that area for the benefit of the graphs or Activity Lists you can display in the other areas. You can also delete the Lowed Dashboard area if you want to add Activity Lists to be displayed in the Upper Dashboard Area and allow full screen scrolling through the list (see examples below). You can limit the types of Activities that are available in the Recent Activities scroll bar. You may want to show only the important ones for reference, so the bar doesn't get filled up with less relevant historical data. You may limit this by creating a dedicated Activity List filtered by type and status. You may remove this scroll bar completely by clicking delete on this configuration option (see screenshot above). Select the options you wish to appear in the Toolbar VS. those that will appear in the Menu. The Toolbar is limited to seven items, while the Menu has no limit. Add our out of the box "Sales" or "Top Items" charts or any charts, graphs and tables queried from your database systems (BI) to the Upper and/or Lower Dashboard areas. You can also load Activity Lists to this area, and use the Account Dashboard real estate to show users Activity Lists across multiple tabs, in addition to or instead of the Sales graph and Top Items info. Edit the Dashboard Area you wish to configure and add the components, including Activity Lists, to the layout. Each component will be displayed in an additional tab across the Upper/Lower dashboard area. Activity Lists - these are any Activity Lists you have created which can also be displayed across multiple tabs. 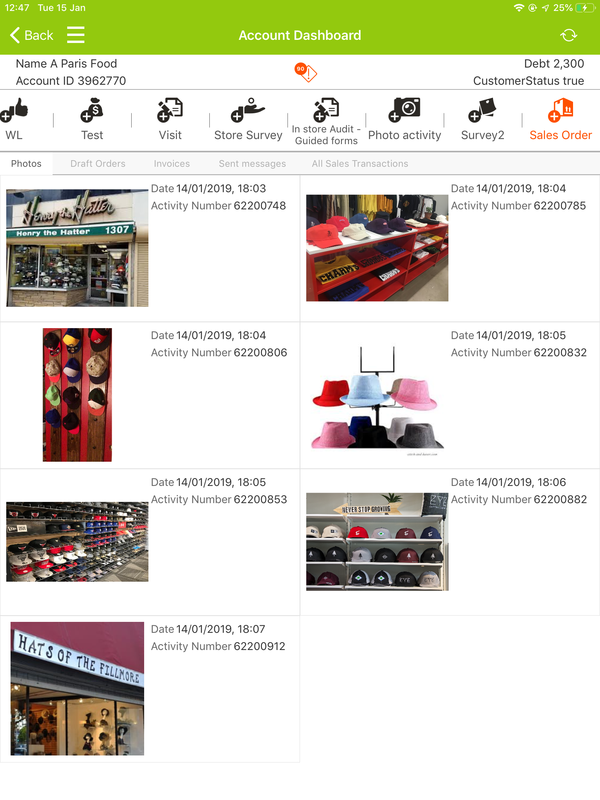 For example: upload data about Sales by Brand, Commissions, Product Lines, Order Types. Example of Account Dashboard Layout with the "Recent Activities" bar and the Lower Dashboard area deleted, and a Photo Activity List displayed on the "Upper Dashboard" area (instead of the Sales graphs) along with other Activity Lists across the multiple tabs. You can invite your customers to the Pepperi Storefront (Web and Mobile) for B2B self-service ordering from the Account List using the multi-selection option. Please note that only Pepperi Admin users can invite buyers. A list of contacts for any Accounts you selected will appear and Select the ones you wish to connect as Buyers. (You must have contacts defined for Accounts in order to connect them as buyers. You can add them manually per each Account or see this article for more detailed information: How to Upload Contacts for Accounts in Bulk). Click Connect as Buyer and you can then customize the welcome message and subject that is sent to invite the buyers to Pepperi for self-ordering. Their username and password will be added to the end of the message. To deactivate multiple buyers (which removes their access for self-ordering) select Deactivate Buyer from the menu. Buyers may be reactivated at a later time. The API could either be a Cloud API or On-Premise one transferring data into Pepperi and from Pepperi into your system. The plugin allows you to configure the transfer of data back and forth using a graphical interface which makes the plugin accessible and simple to use. Who can use the HTTP Plugin? Why is it called HTTP plugin? How does the HTTP Plugin work? If you are using an ERP, accounting system or any back office system that Pepperi does not have a pre-built plugin for (see a list of our plugins here: Pepperi Integrations Directory) you can use the HTTP Plugin to sync your data to Pepperi. If your back end system exposes an API or you if you have your own home grown web services, then you can sync Pepperi with your system using Pepperi's graphical configuration tool - code free! Pepperi's plugin enables you to sync with any system that "speaks" HTTP - doesn't matter if its REST/XML/JSON/SOAP or any other HTTP Request/Response type. Pepperi's plugin allows you to submit HTTP GET/POST requests for querying data- item and customer data, or any other relevant sales data from your system into Pepperi and to submit (usually POST) Transactions/Activities from Pepperi to your system. The configuration of the requests is done via a graphical user interface provided by Pepperi and accessed directly from the Pepperi Web Admin settings. You may also configure more advanced settings to handle the data that is received from your system or sent to your system in a more sophisticated way, for example filter out certain items or customers that you do not want to import to Pepperi. Each of the data-pulling tasks from your system to Pepperi is scheduled to run automatically at intervals that you define, while the data from Pepperi to your system is submitted in real time and the response is presented to the sales rep in the field (using WebHooks). This guide will instruct you on how to set up the importing, exporting and scheduling of data. This diagram desribes the relations between the different components of Peppri’s integration platform. Integration of data from Pepperi to your back-office system is done via Webhooks triggered from Pepperi back-office to Pepperi’s internal endpoint of a “Dataflow task” configured by you, and ends up in an immediate response returned to the mobile app or web app and in a transaction log that you can view and track. Integration of data from your back-office system to Pepperi is done via batch uploads of data triggered by Pepperi’s integration platform Shceduled Jobs that executes 1 or many “Dataflow tasks” configured by you, and ends up in a batch upload to Pepperi and in an execution log that you can view and track. There are multiple data types you can load to Pepperi using CSV files. Data such as Items, Accounts, Accounts-Users, Accounts-Catalogs, Account-Types, Activities, Transactions and more may all be loaded using CSV files with headers. Header names must exactly match the mapped field names listed in the Pepperi back office. This article will explain where to view the names and how to add/edit mapped names if they don't exist by default (not all fields are listed for mapping by default). It's very simple to add mapped names following these instructions, and it will ensure successful upload of your data over time. You will first need to look at the list of available fields for the object you wish to load. This area shows all the fields available for this type of object - in this example Items Fields. The Mapped name is the name that must appear as the header of the column of your CSV file. For example, to load the Item Name, the column header should be "Description", as is shown in the mapped name below. As you can see, by default not all fields have a mapped name assigned. In order to upload data to these fields, edit them and add a mapped name to be used in your CSV file. Note that not all the fields are active by default. If you need to load data to a field that is not marked as active (it has only a green plus sign in the Actions column) then you need to activate it first by clicking on the plus sign, and then follow the instructions below to give it a mapped name. Click on the edit icon for the field and type a mapped name. The mapped name can be any name you choose, it may also be identical to the Field name or the API name. This will not present any problem. If you are automatically exporting files from your ERP to Pepperi, consult with your ERP administrator to choose a mapped name. The fields may have headers that are already coming from the ERP field names, and this may require you to use those same header names. Once you save the mapped name, the data loaded for that field will be mapped to it. Creating mapped names ensures smooth upload of your data via CSV files. Where are the fields for other object types listed? For other objects, such as Accounts and Catalogs, the fields are listed in the Settings -> Accounts and Settings -> Catalogs areas. For Transaction Types and Activities, the fields are listed in the "Fields" tab of each individual Activity Type. For example, Settings -> Sales Activities -> Transaction Types, then edit the Transaction Type you wish to map the fields for and go to the Fields tab to see the full list of fields. Main Category is a mandatory field in Pepperi. Since Quickbooks doesn't force a category field, we automatically create a 'General' main category, so items will upload without interference. Your current data will upload manually in this form. This is a one time operation - the mapping will be saved for any future automatic uploads. The Pepperi for SAP tutorial is available here for download in PDF.